The Field Practicum Team of 2018 in the field. 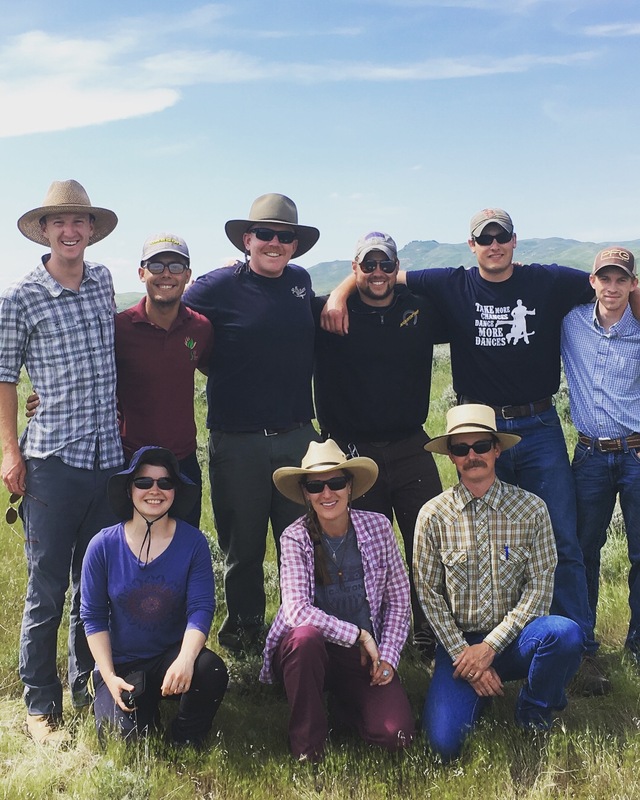 The Land Management Field Practicum (formerly known as “Ranch Crew”) is a two-week rangeland practicum held across the state of Wyoming. Divided into two sections, the field practicum provides students with an intensive dive into rangeland ecology and ranch management before sending them out to complete a rapid assessment on a working ranch. In 2018, the team completed a rapid assessment in collaboration with NRCS, Wyoming Game And Fish, Plank Stewardship Inititaive, Sheridan College, and University of Wyoming. The 2018 crew looked at the effects of a 2017 late-summer rangeland fire (>100,000 acres) on species composition – specifically the ratio of perennial to annual grass. Management implications include forage quality/quantity for livestock, sage grouse habitat, and fire resilience. The 2017 inaugural team completed a rapid assessment of Currant Creek Ranch, a 2,000+ acre ranch in Sweetwater, Wyoming. The rapid assessment was done in coordination with Currant Creek Ranch, Trout Unlimited, and Wyoming Game and Fish. Rangeland Bootcamp (Week 1): Students participate in hands-on, field classes that cover topics such as rangeland ecology, weed management, grazing strategies, ranch financial planning, and wildlife habitat considerations. Rapid Assessment (Week 2): Students will collaborate with partners, such as Wyoming Game and Fish, private landowners, and Bureau of Land Management, to assess habitat surrounding sage-grouse breeding grounds (leks) that have experienced wildfires and those that have not recently burned. The Ranch Crew team will work to prioritize sites into management categories and deliver a report on suggested management actions for future implementation. Before and After Practicum: Students will be expected to contribute 15-20 hours before the course in preparation for the rapid assessment and 40 hours after the course to write up their findings and present them to the partners. Ranch crew is an ongoing collaboration between Sheridan College, University of Wyoming, Yale School of Forestry and Environmental Studies, Plank Stewardship Initiative, and Ucross High Plains Stewardship Initiative. Read more about our student’s experiences during the field practicum.